This topic contains 2 replies, has 2 voices, and was last updated by shortcake2675 7 years ago. Red Riding Hood Cape- Problem with pattern in medium size. I finished the Red Riding Hood Cape last night, but had an issue with the medium size hood. As printed and traced, the center hood doesn’t line up and comes up 5/8″ short. I double checked my traced pattern against the printed pattern and my cut fabric against that as well. I ended up adding the 5/8″ to the end and it went together fine, but I’m wondering if it is a mistake on my part or a problem in the pattern. This is a common problem when you’re sewing a curve to a straight line or an opposing curve. 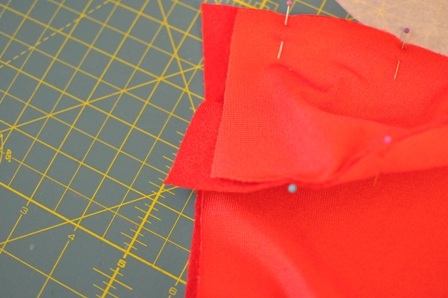 If you pin both ends and then clip along the curved section close to the stitching line the two pieces will match up. What you’re seeing there is that the seam allowance makes the curve itself seem longer than it actually is, but the seamlines themselves are actually the same length. It won’t make a huge difference if you trim off the extra length in this instance, but in some cases it will effect the final piece so this is a great place to practice the clipping/fitting technique for getting those pieces to fit together. Thank you. I was working against a deadline and that makes perfect sense. Thanks so much for the reply!